On August 23rd, the North Central Arkansas Foundation for the Arts and Education will feature The Clark Family Trio, accompanied by guitarist Bill Nesbitt, perform modern Bluegrass, Americana and Gospel favorites, featuring tight three-part “family” harmonies and fingerstyle and flatpicked acoustic guitar. 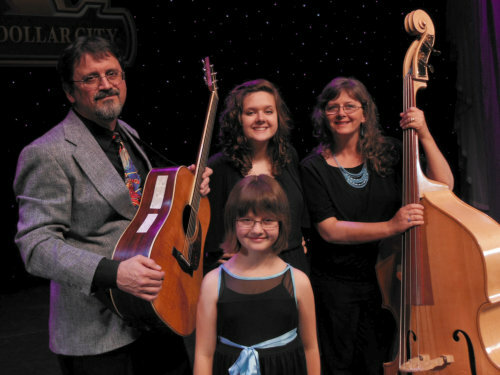 Eleven-year-old Sally Ann Clark and her big sister, 16-year-old Sophie, have literally grown up singing with their Mom, Cindy (who also plays upright bass for the group. All three ladies sing lead at different times, and all three sing different harmony parts, according to the need of the moment. In the summer of 2012, they teamed up with guitarist Bill Nesbitt, who is equally adept at fingerpicking and flatpicking the guitar, and also plays mandolin, banjo and bass on both the band’s CDs. Together they have delighted audiences with their talent and presentation in live shows around Arkansas and beyond. Their set list includes unaccompanied Gospel numbers, traditional bluegrass and Americana, and mainstream acoustic selections of yesterday and today. The band’s CDs feature favorites from their song list, with Nesbitt multi-tracking on various instruments, including guitar, mandolin and banjo. Please join us at the Fairfield Bay Conference and Visitor Center (110 Lost Creek Parkway, Fairfield Bay) from 7-9 PM on Saturday, August 23rd. Tickets are $15 and can be purchased by calling 501-884-4202. For more information about the Conference and Visitor Center visit www.FairfieldBayConferenceCenter.com.